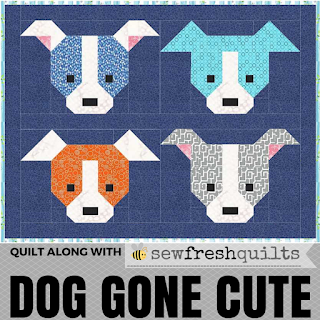 So I've been eyeing the Dog Gone Cute Quilt Along over at Sew Fresh Quilts for the past couple weeks since she announced it. I kind of wanted to make a quilt, but I have a lot going on and didn't know if I wanted to commit to a whole quilt along. So I decided to try a block out. I'd be lying if I said I wasn't a little nervous when I looked at the first block tutorials she posted! 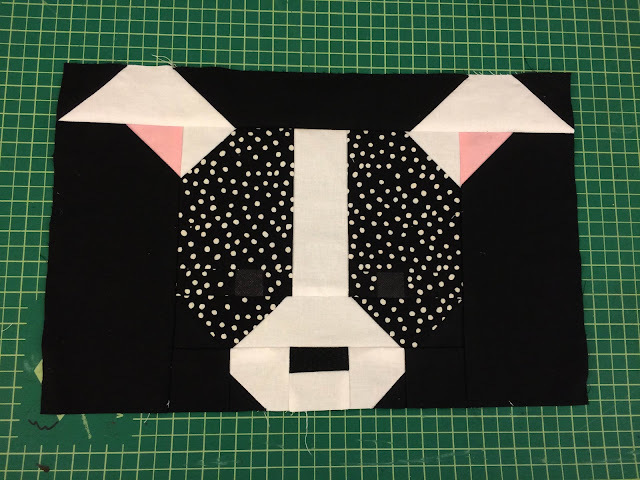 I'm a pretty proficient sewer, but I'm still new to complicated quilt blocks and those seemed a little intimidating. But I eventually took the leap and got one done. And they were really fun to make. It was easier than I thought, and I liked learning how to construct the pieces. I'm pretty happy with the way it came out. It was a little mismatched in the nose, so I have a 1/2" seam allowance in there to fix it...shhhh! :) That extra seam allowance makes it a 11.5" block now...not sure if they were supposed to be a full 12". I knew I was making the "big block" but for some reason it was bigger than I expected. I might try the little guy next. If I don't end up using this for a quilt, I was thinking about making it into a pillow. The only thing is that I don't think I want to use such a dark patterned fabric if I'm doing to do a black background...definitely not enough contrast. I'll probably try a few more with some hot pink/black/white fabrics from my stash and see how it turns out. Not sure who I'd give it to yet though! I'm thinking maybe my friend Mary's 4 year old daughter since I'm making the new baby a quilt. Awww! He's so cute! I am so glad you took the plunge and tried out a Dog Gone Cute block, Jamie. Looking forward to seeing more! Thanks Lorna! I'm glad I could participate...I LOVE your quilt designs. They are so fun! What a cute pup! Kudos for giving it a try. It turned out great. You did a great job on the cute puppy. It would make a very nice pillow. Keep up the good work!